Just to give you some quick ideas, the following list groups together some of the Bratislava area’s most frequented highlights. Those places easily reachable by public transport are so indicated, or you can use the services of our tour guide. Unless otherwise noted, the following list is oriented mostly to adults – for the best ideas on what to do with young children, please visit our Kids page. It’s well worth planning a full day for the historic core of Bratislava. Enormous effort over the last decade has produced a charming setting of authentically restored architecture, in which a wonderful array of restaurants, cafes, bars and shops have taken up residence. If weather permits, a number of public parks (on Old Town Squares, Hviezdoslav Square near the opera, or along the mesmerizing Danube) provide ample seating and public art displays. Cultural highlights include St Martin’s Cathedral, Bratislava Castle, Bibiana children’s museum. And plan an evening taking in a concert or other performance, also in Old Town or adjacent – with a fine dinner at bargain price before or after. By the way: all of the above is within a single square kilometre! Outdoors at Devin and beyond (also available is a more detailed description of a day trip to Devin). 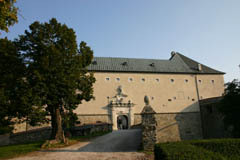 The castle at Devin, one of Slovakia’s national icons, is essentially a well-preserved ruin. The large complex, many parts of which are open to the public (including a small museum of costume pieces and other effects), is easily good for one or more hours. Its history dates from the early middle ages, and different parts of the architecture bespeak various centuries, up to the time Napoleon’s armies put it out of action as a functioning fortress. Sandberg, in Devinska Nova Ves (also reachable by bus), is one of the largest sandstones in Europe, offering both a lovely view of Austria and some fun fossil finds. Down below, along the Morava River, wetlands play host to storks and other migratory birds and wildlife. Pajstun, above Borinka village and near Stupava town, is a medieval castle ruin, well on its way to being reclaimed by nature but with some fascinating details (particularly the gate, with walls and gargoyles) quite intact. It’s a stiff one-hour hike uphill from Borinka, or a more leisurely walk from Stupava. Popular spot for campfires. If the weather is pleasant, the riverside trail is popular with bikers and roller-bladers, with many a nice spot for picnicking. Kayakers bob expertly through the wavier sections. If you plan to visit both Gabcikovo and Danubiana in a day, plan to continue from the museum into Hungary toward Gyor, then cross back into Slovakia near Velky Meder. Gabcikovo Dam, 45 km south of Bratislava on the north (Slovak) side of the river. One of Europe’s largest dam complexes, built for hydroelectric production, flood control and navigation purposes. Features two locks of over 15 metres and a fish ladder. Cerveny Kamen, near the village of Casta. Originally built in the 13th century as one of a string of fortresses to protect against Turkish onslaught, the castle as seen today mostly evokes a 16th-century reconstruction. Extensively furnished indoors, with falconry shows outdoors in season. Gerulata, in Rusovce. This village south of Bratislava, reachable by city bus, holds a tiny museum near the church, with a Roman well, fortification masonry and household effects. Villa. Find the Technosklo factory just outside of Bratislava’s westernmost section of Dubravka. A trail marker will guide you the 500 meters to the middle of nowhere, with a set of unmarked foundations in an almost eerie recreated setting, the site of some ancient’s country home. Information on relaxing rides, as well as active canoeing and more. Where to ride, how to get there, bike rental and other ideas. 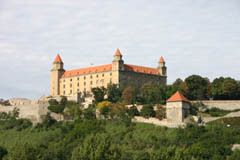 Bratislava tourist information, hotels, car rental, apartments.